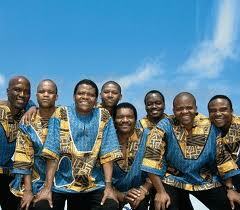 I wasn't expecting to feel so discombobulated by the Ladysmith Black Mambazo concert last night at Yoshi's in Oakland. After all, this is a stellar vocal group from South Africa whose bevelled, tight-knit sound western US audiences have grown to know and love ever since the mid 80s when Paul Simon employed the ensemble's artistry on his Graceland album. At this point in its 51-year-history though, Ladysmith hardly needs to defer to Simon, and yet for some reason the singers feel obliged to do so. The fact that "Homeless," the song that was the thoughtful centerpiece on Graceland all those years ago, was used as the climax of last night's set, made me feel a bit sad. It's true that there are few commercial artists in the world that can get away without playing at least one of their best-known crowd-pleasing songs during the course of any show. (For instance, Neil Young wasn't above playing 'Helpless' the other day at a gig in San Francisco.) But usually, artists have a bunch of different emblematic tracks to choose from once they've been around for as long as Ladysmith. "Homeless" is unfortunately the only track that is truly well-known enough to American audiences. So Ladysmith pulled it out, of course mentioning Paul Simon in the process. Frankly, the Simon connection is not why we pack venues like Yoshi's on a Wednesday night (for two sets no less!) to hear Ladysmith make music at this point in time. The richness of the sound, with all its strange and wonderful accompanying choreography and unexpected vocal sound effects conjuring up a completely different way of life that's much more closely connected to farming and nature than ours is enough to keep crowds coming. It's time for Ladysmith Black Mambazo to put Paul Simon to rest.